On 30th of April, 2016, the basement hall at Instituto Cervantes New Delhi was full house. It was the second and final show of Pablo Luna Carné’s renowned Zarzuela, El Niño Judío (The Jewish Boy), brought to life by the European Union Delegation, Neemrana Music Foundation and a small ensemble of musicians. The artistes received constant training and encouragement from Óscar Lobete, Sunit Tandon, Jasmin Martorell and Nadya Balyan to make the performance a memorable one. It was my very first encounter with this Spanish lyrical drama genre, which owes its name to the Palacio de la Zarzuela near Madrid. The story in a nutshell is about two young lovers forbidden to marry. The girl’s father disapproves because of the boy’s Jewish links and unidentified parentage. By a certain twist of faith, Samuel, Concha and her father, Jenaro embark on a journey beyond Madrid to reach the busy market area of Aleppo, only to be directed towards the luxurious, palatial lifestyle in Baroda, all in the quest of Samuel’s lost and unknown father. In the end, Love triumphs despite the irony of Samuel’s fate. The beauty of the Zarzuela emerged as the scenes skillfully merged the melody with the text. The entire cast reflected a happy and cheerful demeanor throughout the choral singing, solo acts, dancing and instrumental sections. This stirred up an amorous desire within me, to revisit my broken Spanish. I wanted to access at least one significant vignette about Pablo Luna Carné and his Zarzuelas. Diccionario de la Zarzuela : España e Hispanoamérica helped me in this endeavour. Pablo Luna Carné was a composer and a director. He was one of the outstanding creators of Zarzuelas during the third phase of the 20th century. He started learning violin with Teodoro Ballo Tena at Zaragoza. Later he took training in harmony and composition from Miguel Arnaudas Larrodé . Thereafter, he learnt from the master of Capilla of La Seo. After finishing his studies, he played violin for theatres and cafes until the year 1900. That year, Pablo signed a contract with a major Zaragoza company that concerned itself with Zarzuela and Opera. One of the most important works that gave Pablo Luna Carné immense fame was staging of the show El Niño Judío based on the book by García Álvarez and Antonio Paso. The audience was thrilled and demanded a repetition of the work, at least three times. It was a grand success and remains a moment of glory until now. Pablo Luna Carné is considered to belong to an era of Zarzuelistas who brought about the transition between the genres – Chico and Operetta. He even came close to resembling a certain heritage due to the influences in his work, of some of the major figures – Chapí, Fernández Caballero, Chueca and Giménez. Carné belonged to a generation that seamlessly incorporated various influences in the instrumental and harmonic arrangements, the lessons by Wagner, Verdi and various French composers, especially Ravel and mid period Debussy. Due to self driven education, Carné is representative of a slow yet sustained composer, all over the world. A lot of interest has been generated by the dances, for instance, of the exotic countries, whereby Carné has managed to capture native life and the epoch in the tale, at the same time anticipating the sentiments of the conventional public, usually filling up the theatre seats. Conrado del Campo, one of the composers based out of Madrid, found that Carné’s work represented an elevated conception of his art, harmonies guided by exquisite sensibilities, a rich orchestra and a luminous palette all within a clear understanding of the form. Also, most of his romantic works, including El Niño Judío, inevitably leaves a folkloric imprint. Óscar Lobete, the music director and the pianist of the Zarzuela, El Niño Judío (The Jewish Boy), otherwise a freelance musician playing solo concerts, conducting orchestras as well as Zarzuelas across Europe and USA spoke about his journey with an Indian Opera group. “Instituto Cervantes called me as I did this particular Zarzuela lot of times in Spain. When they explained to me the involvement of Neemrana Music Foundation and the kind of works that they do, I fell in love with the project. We started working 15 days ago. 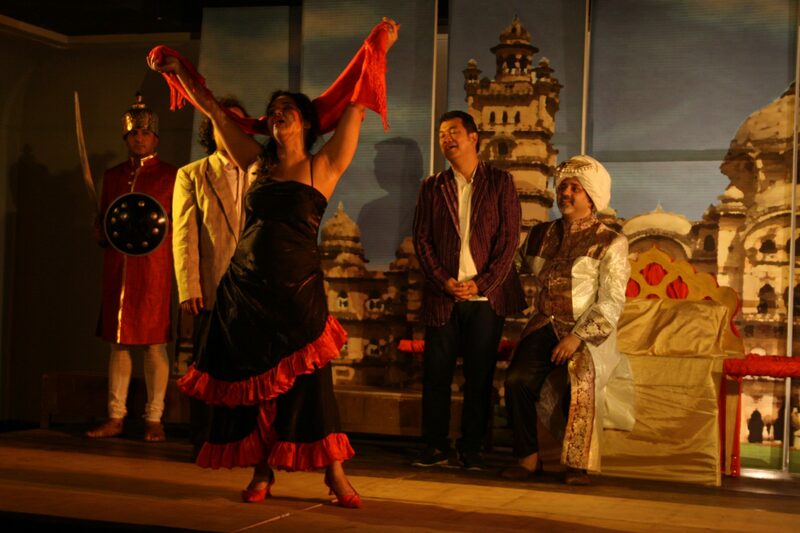 All I can say is that the people here are very kind.” He was really happy to learn about some of the famous operas that Neemrana had staged and was thrilled by the unique shows put forth by the association to keep this performance genre alive. Three distinct features about staging the Jewish Boy in India was that for the first time, an un-edited version of the Zarzuela by Pablo Luna was performed, it was performed outside Spain for the first time and many details were completely new, for instance the personality of the characters and even the language – conversations were in English while the musical act was entirely in Spanish. Óscar Lobete wishes to do more shows but is unsure if the necessary finances will come to be realised. Jasmin Martorell has been the Vocal Coach of the Neemrana Foundation since the year 2014, when Neemrana had put together Romeo and Juliet. He performed as the protagonist of The Fakir of Benaras in Delhi and Mumbai in the year 2003. He is often summoned to teach in France, Brazil, Mexico, Iran, Spain and Morocco among other countries. He prefers to work in India during the following months – September, February, April and November. He stresses on the importance of working regularly with the singers during big productions such as this one. When asked about the specificities of training, he said that the breathing exercises are the most vital ones. “The repertoire of the music has to be sung in the classical way / Operatic way.” Last year, when Aude Priya Wacziarg, the managing Trustee of the Neemrana Music Foundation met Jesús Clavero Rodríguez, the Cultural Manager of Instituto Cervantes, during the performance of another Zarzuela in November, Los Claveles Incarnations, this cultural exchange was planned. Shireen Sinclair / Sparsh Bajpai spoke about their individual experiences while enacting the role of the pretty and cheerful Concha, Samuel’s lady love on two different days. For Shireen, this was her second zarzuela but she found this one to be exhilarating! It was much more extensive and a fun role compared to the last one. Sparsh, on the other hand, was excited to sing in Spanish for the first time. She really enjoyed internalising the way of talking and acting like a niña Española. They were both happy that the Opera was accompanied by a chamber choir whereby, they had a violinist and a cellist. Both found it an honour to be able to work with the conductor, Óscar. Prabhat Chandola, the Jewish Boy with the mysterious parentage found his second Zarzuela much more comfortable than the first one. “The dialogue delivery was easier with the music this time. The music director was a great help! It is important to acknowledge the assistance that you get from the piano. It was a long role as well. One and a half hours of speaking as well as singing. However, there was a connection of the music with the characters in the long expedition. Yogi Ponappa, the Classical guitarist, played with the ensemble alongside acting in certain scenes like one of the Market scenes at Aleppo or the Palace scene with the King, Queen and the travellers at Baroda. He too stressed on the uniqueness portrayed due to the use of Spanish in matters related to the sound and English when it came to conversations. The orchestral set up intrigued him as well. This particular role even urged him to train his Baritone voice. The various conversations hint at the musical style of this particular Zarzuela, which is in two acts, divided into three scenes. The entire preparation process involved in the performance is also revealed by a few. The Jewish Boy, performed in India for the first time did retain some of the personality quirks associated with the actors, which of-course, added to the characters as imagined by Pablo Luna Carné. Dialogues in English enabled the audience to relate to joy, hope, anguish, hatred and love imbued in the musical act, more easily. This beautiful Zarzuela will stay with me for a long time to come. After all, it initiated me to a whole new musical genre.